I really enjoy Mondays. Though, I haven’t always. In fact I used to spend Tuesday-Sunday dreading the upcoming Monday. Extreme? Probably; but when I was young(er) with few(er) worries and responsiblies, Monday meant that the weekend was ending…and work/school was starting. Mondays were an unpleasant jolt back to reality, and I hated them for that. Now, I work every other weekend. And sometimes Monday signifies the end of my week, not the beginning. Monday is the new Friday. Sort of. Mondays also mean I’m obligated to go to the gym. I need routine and consistency. I also need to feel accountable, and the only thing I’ve found that works is to sign up for a program where I know people are expecting me. For some weird reason I feel worse letting down complete strangers than I do letting myself down. How screwy is that?! So, Monday night has become Cable Class night. And I look forward to it! I really like all the trainers at the gym, but I’ve got to say I’m partial to either Paula or Angie. I feel that they know my limits and know how to push me. They also know when I’m being lazy, and that’s important…If they have all this faith that I can do something, maybe I really can. And that’s usually how it works. Tonight’s cable class was extra hard, probably for a few reasons. The first being that I haven’t really worked out since returning from India—call it an extended holiday, if you will. Secondly, I decided to wake up this morning and take a yoga class. My arms were on fire! Now, they are jello. …But I feel good. Like, real good! After the gym I came home and heated up dinner. Because my class is at 7:45 pm and I don’t really want to work out on a full stomach, I usually put together a meal and have it all ready to heat up when Piyush and I get home around 9. I know 9 seems like a really late time to eat a big dinner, but it’s what works for us…so we do it. Tonight we had Greek! We love Greek food and tend to order take out way more than we should! I decided it was probably time to make something healthy that had those same flavors, and today was as good of a day as any other. This dinner was really simple and honestly there aren’t really any “real” recipes. Basically it’s brown rice with a little lemon juice and greek seasoning, grilled and seasoned chicken, and steamed summer squash/zucchini. 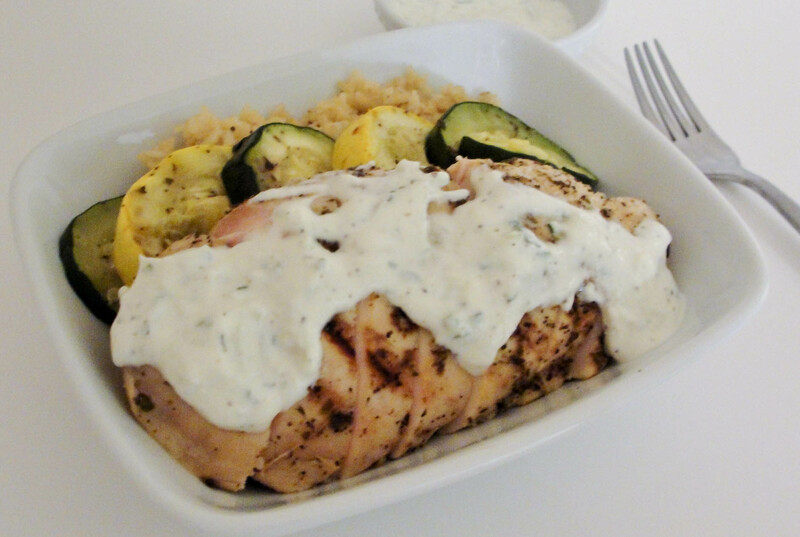 I also smothered it in tzatziki sauce! I wish I could say I made the sauce, but I had a container of tzatziki left from the restaurant here in town. It’s a yummy yogurt based sauce that makes a great dip for celery sticks, so I always try to have some on hand. It’s really easy to make too…and next time I actually make my own I’ll definitely share the recipe! But now I have to sleep! I have to work early tomorrow. Tuesdays….sigh. The only good thing about Tuesday is “Teen Mom!” Hah! Oh! Before I go, I also have to just say that I am so proud of my little sister!!! She had an interview today at the Mayo Clinic School of Med….and I couldn’t be more excited for her!!!!! There are only 2 more spots open…and 12 more to interview, but I know she’ll get accepted! They’d be goofy not to accept her! She looked just like a little doctor, all dressed up in her suit and pearls. Yay!, Michelle! This entry was posted in Diet, Food and tagged Chicken/Poultry, gym, healthy recipes on January 10, 2012 by Shari. Looks beautiful! 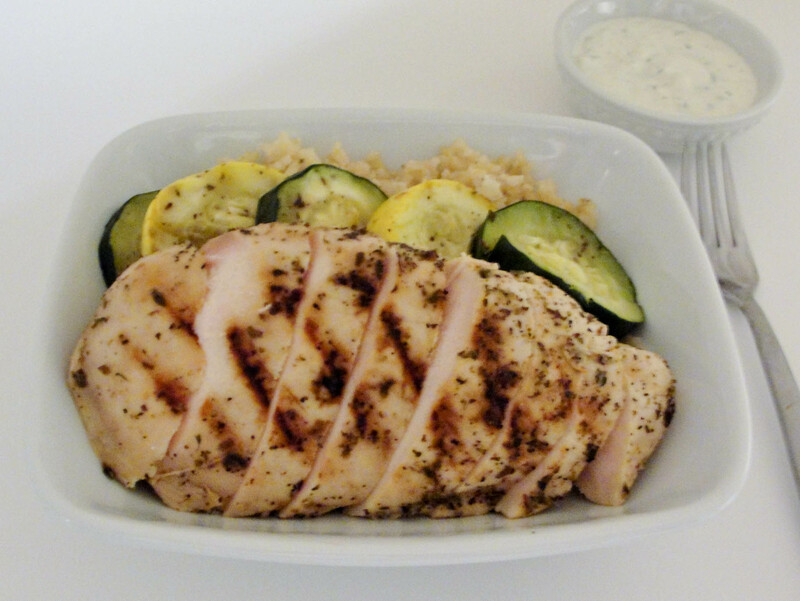 I love the perfect grill marks on your chicken, and the zucchini and squash are such a perfect, healthy addition. Like you, I need to have a set routine, or I get frazzled and start making excuses. When we were in Rochester in October, you served us a delicious dessert square, made with one of your canned fruits. If you can figure out what I mean, would you mind sending the recipe please.